International Varieties: Are They Intended to Reflect their Origin or are They Made to Please? In my last post, I highlighted an ‘international’ grape variety, grown in Spain, made in Spain, but not allowed to say which region it’s from because the local Denominacion de Origen (DO) doesn’t recognize Viognier as part of its ‘terroir’. Whether this is fair or not is a difficult question – just what does a grape have to do to be allowed in a region? For the most part, it seems it has to have been there, on the spot, on the ground, as it were, for longer than living memory. Which is fine. In the case of Norrell Robertson MW’s Viognier – good as it is – it hasn’t been there long enough. And that might just about seem justifiable. It’s a shame that such a good wine doesn’t have a region classification, but not everyone makes good wines from Viognier. Even the Rhodaniens struggle. But then I would point you to the fact that La Mancha, for example, allows Pinot Noir. Which is grotesque. It’s like putting a supermodel on a prison ship – there are no happy endings and it won’t be for public consumption. So let’s turn to Rueda. Now Rueda, in southern-central Castilla Y Leon, already has a lovely indigenous grape. It’s called Verdejo. It also allows Sauvignon Blanc, the Barry Manilow grape variety (a crowd-pleaser that tours the world with numerous facelifts). To be fair to the Rueda DO, there are pretty clear rules about the labeling and use of Sauvignon Blanc in the region. This particular wine – Finca La Collina – is 100% Sauvignon Blanc and so sports the grape variety proudly (?) on the DO sticker on the back of the bottle. The thing about international varieties is that their use falls strictly within certain parameters. Firstly, they should be good: there’s no point allowing these varieties if they’re not drinkable. Secondly, they are – I think we all agree – slightly ‘removed’ (in our minds) from their region of origin: they might grow Sauvignon Blanc in Rueda, but it isn’t really Rueda. And here is the big problem with international varieties: are they made to reflect their origin or are they made to please? Marlborough Sauvignon Blanc, for instance, just about makes it onto the ‘origin’ bandwagon (with one foot still on the ‘quaffable’ road). If I’m honest, I don’t believe Viognier will – in my lifetime – really ‘be’ Calatayud (no matter how much I think it has the potential to be). What is perhaps unfortunate is that these wines try all to often to please us. Which is, I think, what La Colina is doing (a big, fatty, ripe style of Sauvignon). So maybe I shouldn’t judge it as Rueda but as a ‘first on the list in a wine bar’ wine. 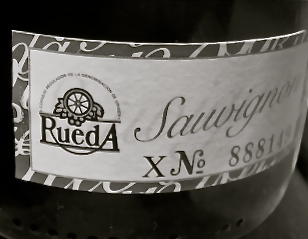 The problem is that, as well as ‘Sauvignon Blanc’, it also says ‘Rueda’ on the label. Ripe, grassy, very Sauvignon Blanc nose (tinned asparagus, etc) that ventures into the tropical with mango and passionfruit notes. A crowd-pleasing style that’s quite broad and weighty with a textured finish. A ripe, quite heavy, style of Sauvignon Blanc (serve blind to friends and ask them to guess where it’s from). I really do think Rueda should leave Sauvingon Blanc and stick to Verdejo.